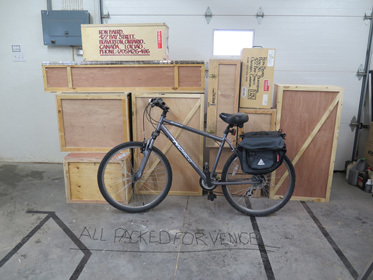 Ron has been selected as one of only 30 artists from around the world to participate in the internationally renowned La Biennale di Venezia in Italy. His works will be on display in the Palazzo Bembo, a Renaissance palace on the Grand Canal, from May to November. The theme of this year's exhibition is 'Free Space', celebrating art and architecture with world-class ideas and displays. 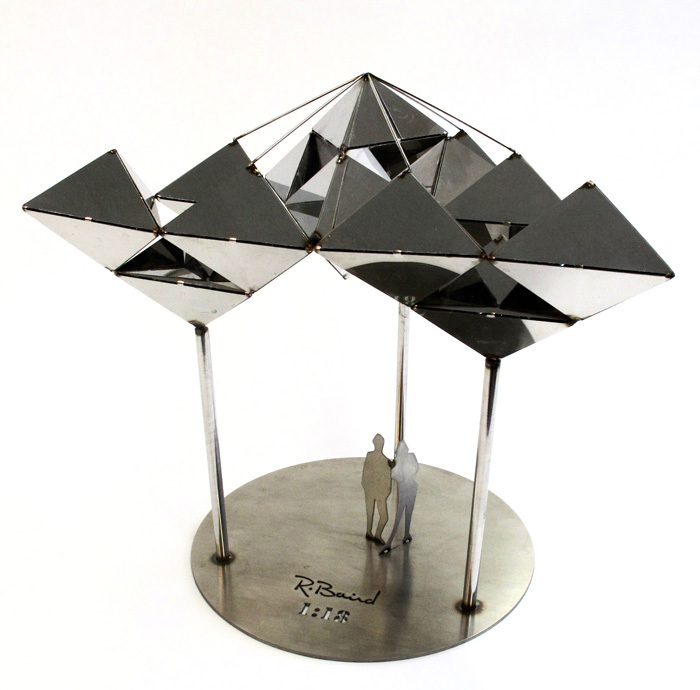 Ron has been awarded and gained his reputation for creating sculpture in the context of architecture. What, if there was a party in the Palazzo Bembo tonight and all the great artists from whom you have learned and loved, from all times, past, present and future, were celebrating there? “J'aime vraiment vos créations!” Or, bored by your efforts, would they turn their backs and talk excitedly about more interesting works? The artist’s goal is to do his or her best to create things that are timeless and that will be treasured by the legendary people at the party, always. 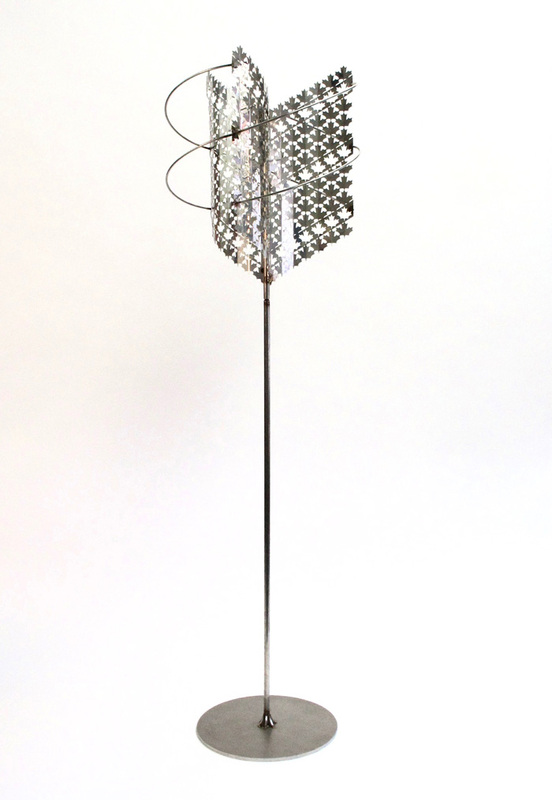 Often using stainless steel as a medium, along with naturally kinetic designs, I can only hope my installations will not only last, but continue to engage the viewers over time. I strive to stimulate inquisitiveness in the viewer, a feeling of wonder -'suprisement', if you like. Some of my works weigh literally tons, yet they dance and spin in the wind, underscoring the power of the elements in all seasons, at all times. If you imagine that you are a bumblebee full of sunshine and joy, blessed with compound eyes, able to hover, dart and dive effortlessly through space in any direction, then you know how I explore architectural and sculptural spaces to seamlessly blend them. My choice of stainless steel is very deliberate. Because it has naturally reflective qualities it can mirror its environment and the moods of the sky, the activities of the people, colours and seasons. Many of my pieces are situated in public spaces, complementing the structures and landscape of the area. Working closely with architects, I feel that public art bestows a sense of place, strengthening the connections between people and their surroundings. It can be integral in fostering a community's sense of identity, honouring its social, historical and cultural threads - il motivo festeggiare! A reason to celebrate! Art was first conceived of as magic, it was a way to influence the luck of the hunt, to enhance fertility or honour beings, to bring abundance, protection, healing and life after death. Maybe, it still works that way. It certainly can manipulate your feelings, love, laughter, anger, disgust and status too. It diddles our senses, our wonder, our pride and contentment. Making or viewing great art is a powerful affirmation of our existence and that is a welcome thing, essential to survival as humans. My challenge is to create works that are aesthetically complex yet visually simple, inviting the viewers to find their own magic and sense of existence in their reactions. I'm inspired not only by nature, but also by the archetypes known to us all. How the designs are interpreted will differ because of our own unique life experiences, but the themes are universal. I hope to continue my lifelong dialogue with architecture and with form, with all of its challenges and rewards. 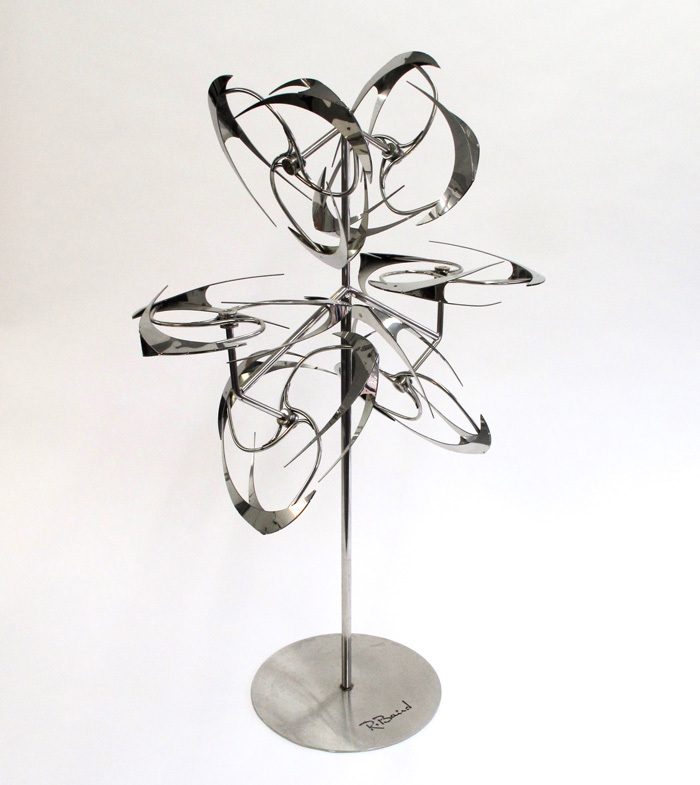 Inspired by the random twirling of maple keys, this piece moves in many directions, with the breezes spinning the sculpture in complex circles. This was a private commission, and is located in a beautifully landscaped setting. “Our family has been surrounded by and imbedded in Ron Baird’s art for almost 50 years. 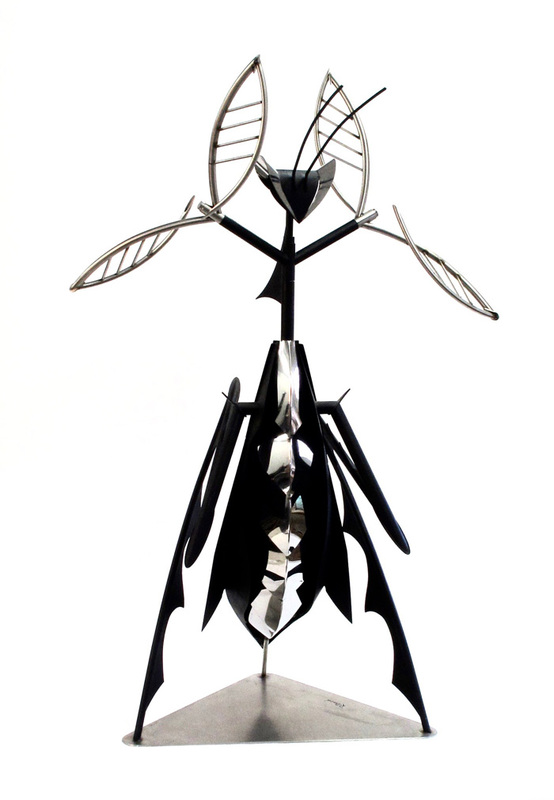 His art is on our properties and in our homes as sculptures that move in the wind, railings, books on table or etchings on our walls. Why this long-term love affair? We think it is the surprising and enchanting diversity of his approach. 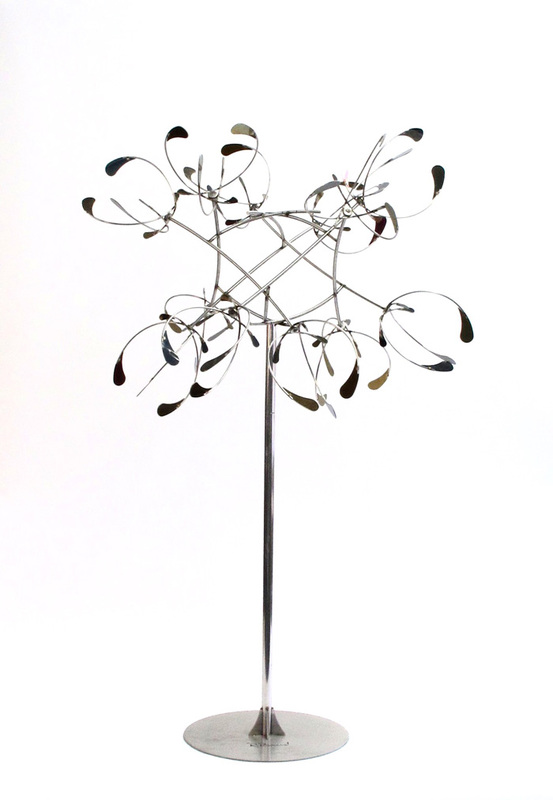 The pieces we have range from the dramatic “Tree of Life”, the whimsical and playful “Snakes and Ladders”, the amusing “Gate to Nowhere” to the symbolic “Wind Chimes” and “Daughter of Spirit Catcher”. Ron’s legacy of art has moved into the third Sellers’ generation, with a wedding altar for one daughter and bed headboards for the other two – an owl for one and an elephant for the other! We hope Ron’s models give you a sense of his artistry and flare for the dramatic and unusual. Chosen by a jury from a nationwide call-out, this towering kinetic sculpture has steel columns intertwined in a complex pattern resembling the flow of water, topped with blades that spin in the wind and illuminated by LED lighting. Wade Morris, Innisfil Hydro Vice-president of Engineering and Operations said the sculpture embraces Innisfil’s history, renewable energy and will be a significant landmark on the property. This large, graceful installation was commissioned for the gateway of a new housing development in Bradford, Ontario. Symbolic of happiness in many cultures, the dragonfly has become the logo of this community. Its transparent wings move naturally in the wind. 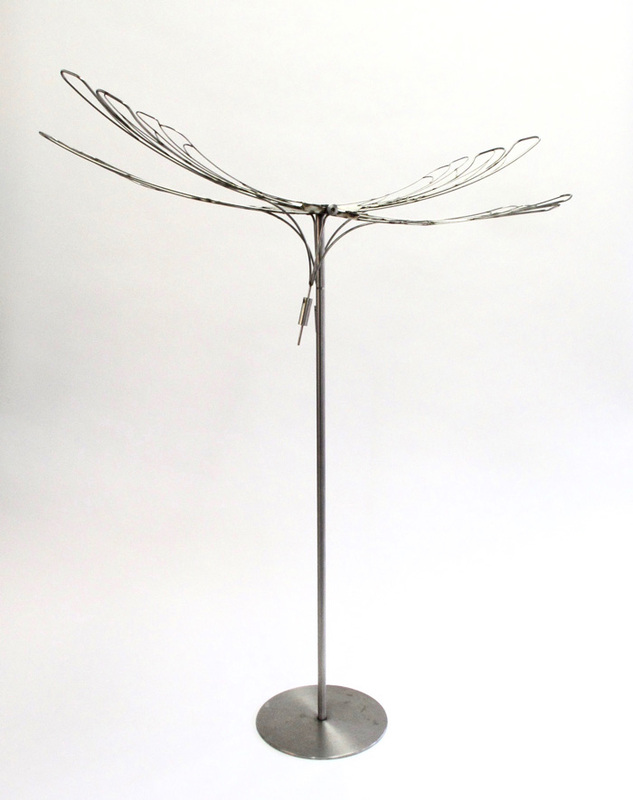 This seemingly delicate kinetic sculpture was designed to enhance a public butterfly garden. It was produced in an edition of five for private estates. 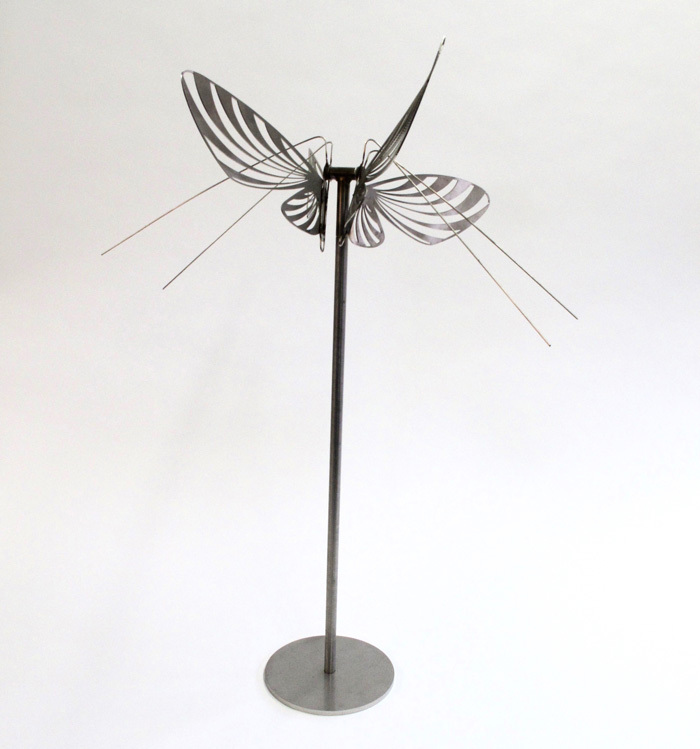 This kinetic installation was designed for a site near Limerick, in the Republic of Ireland. Baird’s inspiration came from archeologists exploring the area who uncovered round stone weights used for spinning wool and flax. Local lore determined that these stones were in fact faerie wheels, specially employed by the wee folk. The ancient art of hand spinning using ‘the drop spindle’ represented here, dates back thousands of years. Cynthia Voisin, Project Coordinator of Kitchener’s Boardwalk. 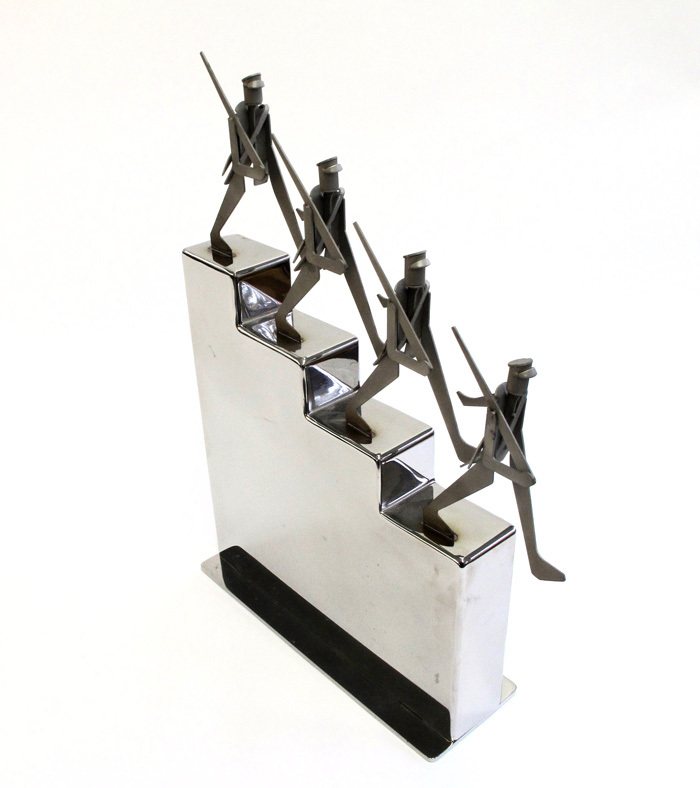 This poignant piece was designed as a memorial for Italian prisoners of war. 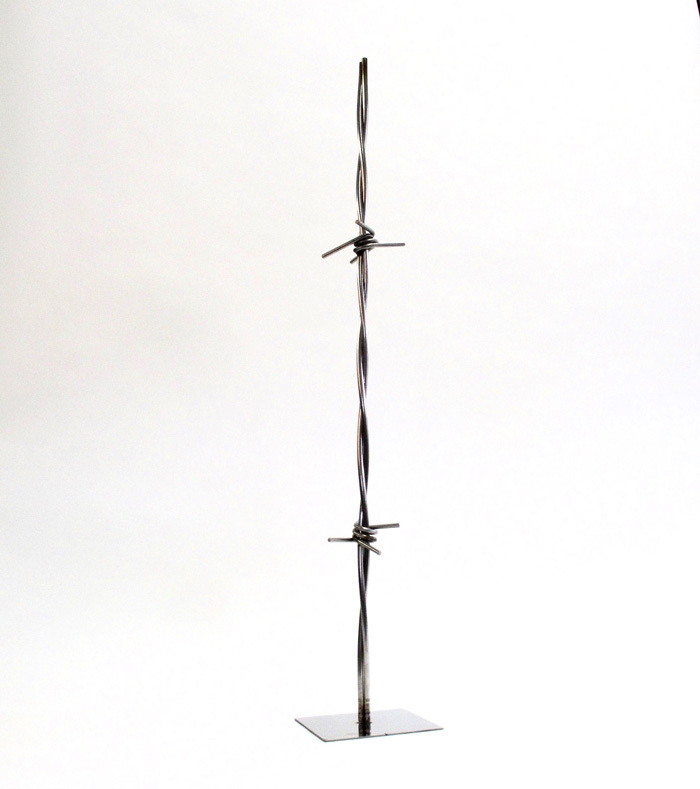 This single strand of barbed wire stands fiercely vertical, stripped of all nuance. It denotes not only the strength and endurance of the captives, but also their agony. 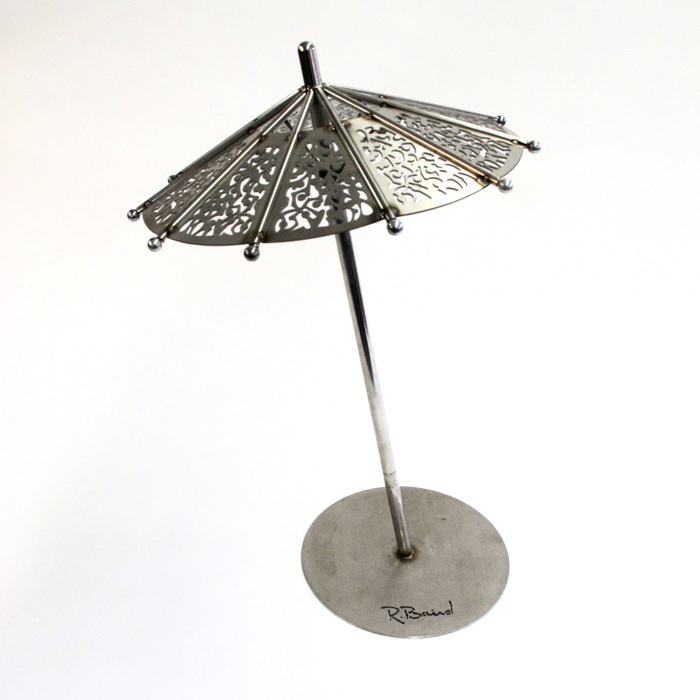 This maquette is one module of a dozen umbrellas created for Leitchcroft Park in Markham, Ontario. Water randomly sprays out from the tips of the umbrellas, much to the delight of the children playing in the summer sun. They also create a delightful whimsical space for the observers. In the winter, after a heavy snowfall, they transform into a magical mushroom forest. 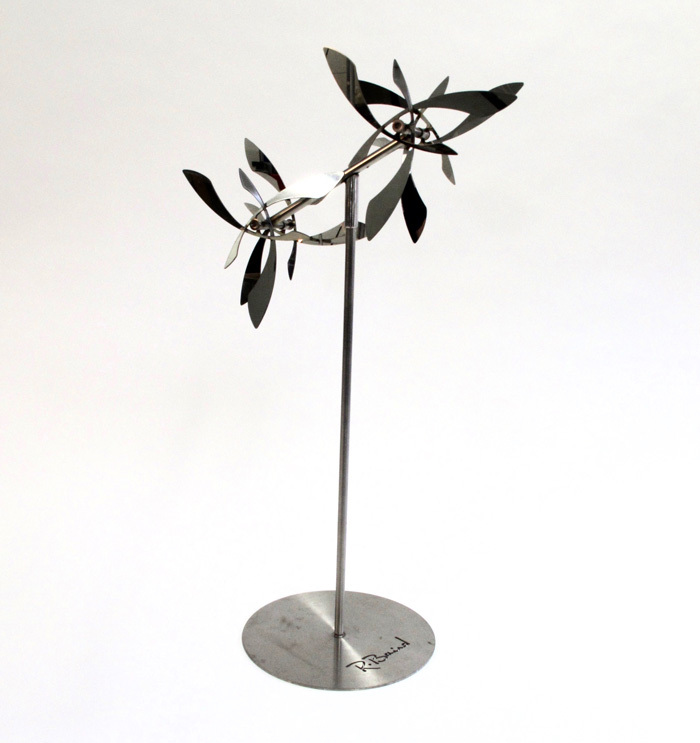 Situated on the shores of a northern Ontario lake, this piece entertains in every season. Its flashing blades either sit idly, reflecting the summer sun with flashes of silver, or twirl ferociously in the winter gales. 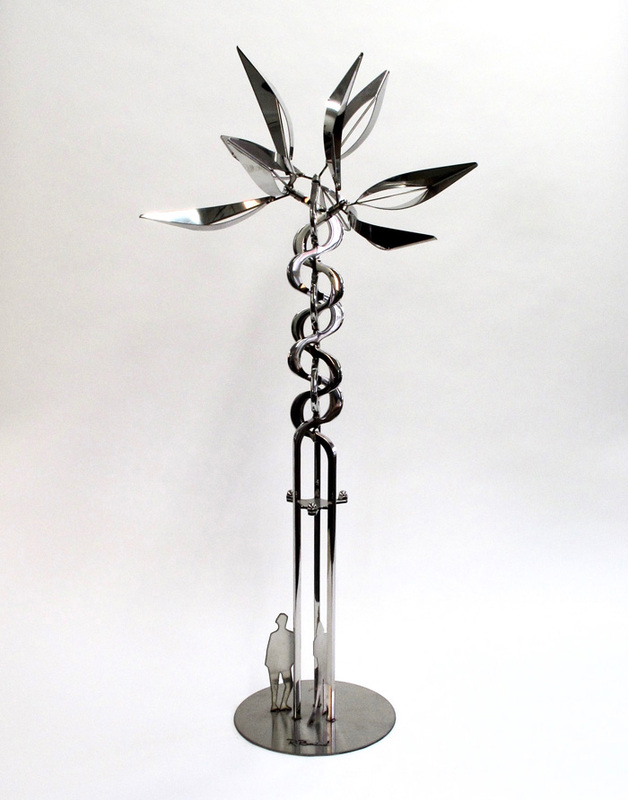 In 2011, Baird installed this kinetic piece, The Honouring Tree, commissioned by the African Canadian Heritage Museum. It commemorates the historic settlement of people of African ancestry in Saskatchewan, Canada. 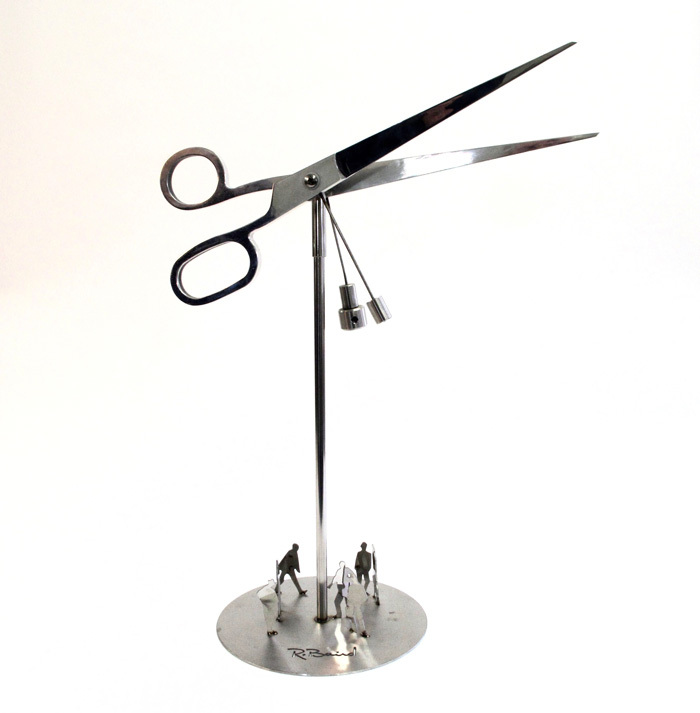 Animated by the wind, this design for a monumental pair of scissors is both playful and formidable. A Cut Above is a very memorable landmark, both amusing and ominously potent. A war memorial designed to honour the courage, bravery and commitment of those who fought for freedom. 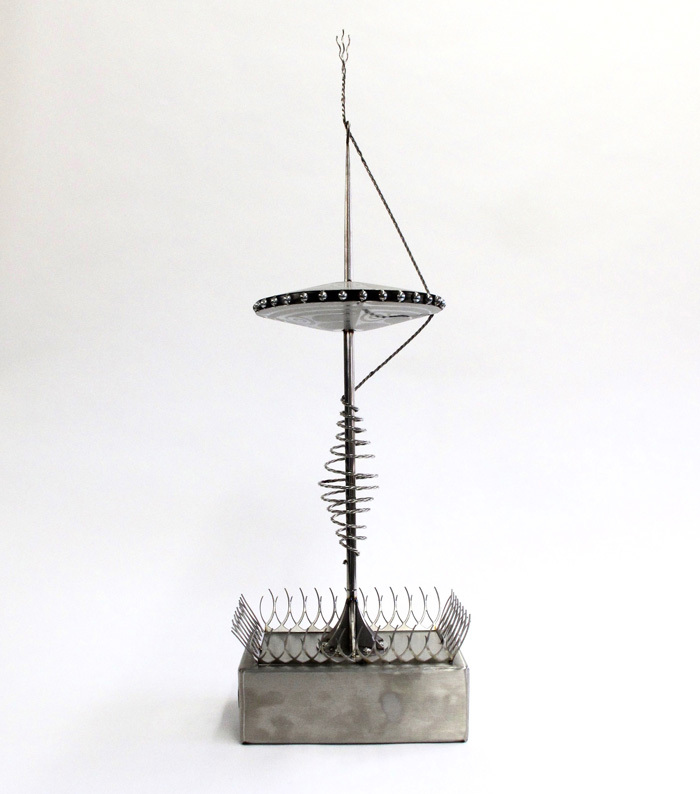 This design won ‘Best in Show’ at the Robert McLaughlin Gallery, Ontario Canada. 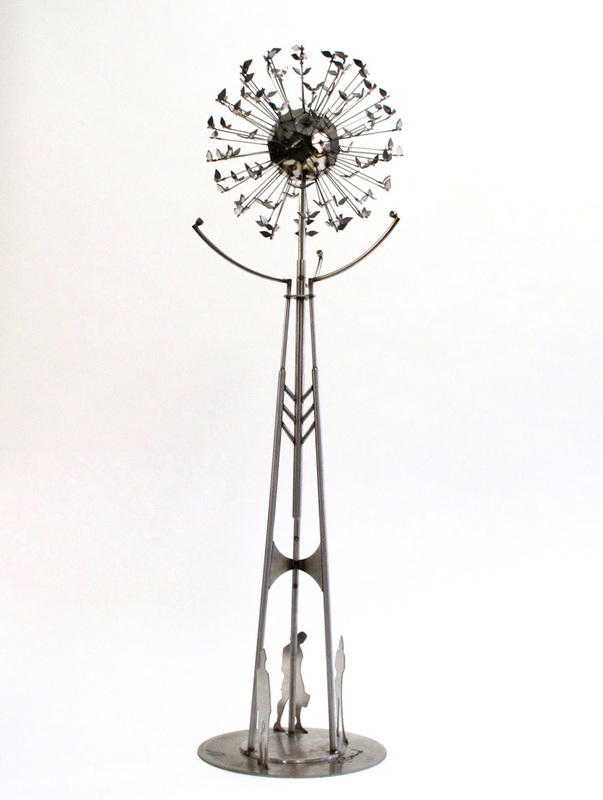 One of several pieces Baird created for the public sculpture walk in Stouffville, Ontario. The term “fractal” was first used by mathematician Benoit Mandelbrot in 1975 who used it to extend the concept of theoretical fractional dimensions to geometric patterns in nature. Baird has created a fractal, challenging the viewer to participate in the complexity of its design. In Kitchener, Ontario, in front of a municipal community centre, Baird was commissioned to create this kinetic piece, appropriately called The Gathering Tree. It features hundreds of shining maple leaves that twirl naturally in the wind – a symbolic welcome to new Canadian immigrants. 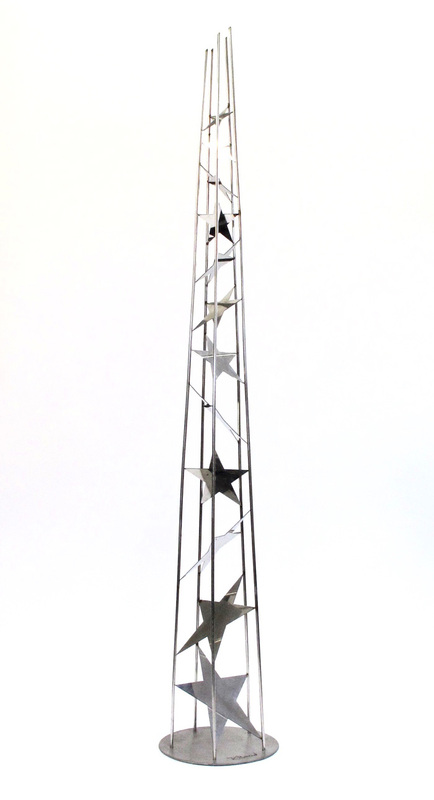 In Oshawa’s City Hall, Ron’s Tower of Stars is a tribute to the heroes of Oshawa. He created the rising shining stars so that they will, not just reflect the changing light, but also the viewers themselves – the stars of the city. 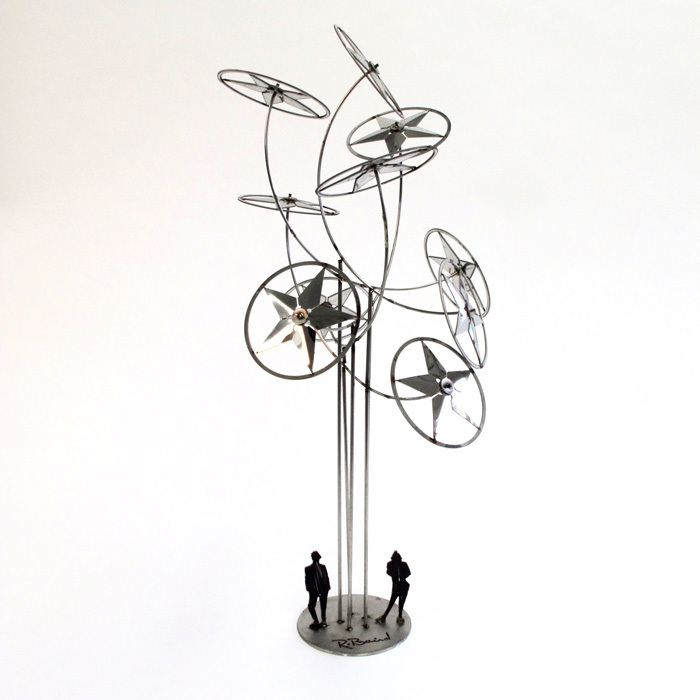 This sculpture stands approximately four stories high with naturally moving kinetic parts. Destined for the shores of Lake Simcoe, Ontario, she will pay tribute to the First Nations People of the area while welcoming boaters to Beaverton’s Harbour. 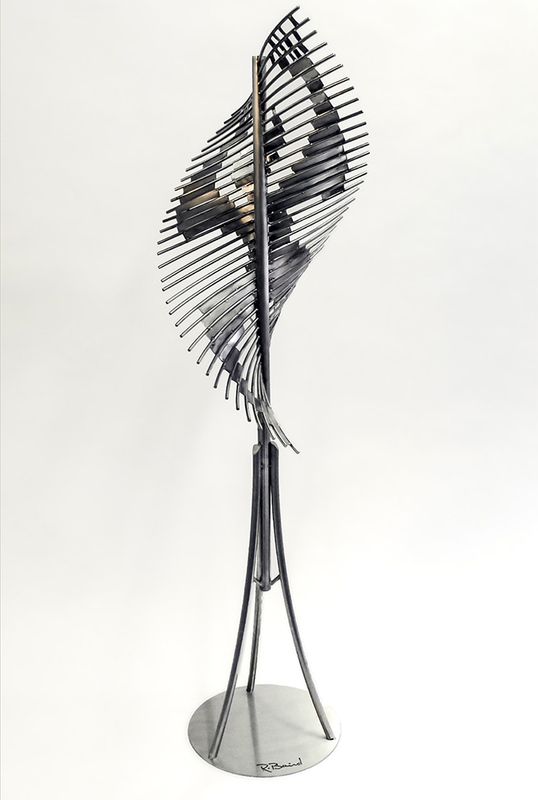 Baird was inspired by the creation myth of the Iroquois, which tells of the woman who fell from the sky and was rescued by birds who carried her gently down. Since the earth was covered by water at the time, a giant turtle rose from the depths and the muskrat brought up mud from the bottom to place on the turtle’s back. This became known as Turtle Island, also known as North America. This unique sculpture is designed to become an iconic Beaverton Harbour landmark.